Are you willing to have your view of Arthurian, British and Christian history challenged? Are you ready to accept the esoteric mysteries and heresies of the Knights Templar? Once we understand that Jesus and Arthur shared a common history, the rest of Arthurian legend starts to fall into place. So join Ralph on an extraordinary tour of Arthurian history, much of which you did not even know existed: Jesus’ son was the king of Palmyra; St. Peter was the Guardian of the Holy Grail; Pompey the Great and the pirates of Gibraltar; Secrets of Mithras and the bull of Taurus; King Arthur’s battle with Vespasian; The Roman creation of Christianity; The Holy Grail was brought to Earth by aliens; Sir Galahad dressed as a woman; The burial of Jesus-Arthur at Stonehenge; tons more. These are all elements of the Arthurian chronicles that have remained unexplored and unexplained until now. But how can we comprehend the true history of King Arthur if we have not considered the entire corpus of this labyrinthine story? If we bring all these many diverse strands together, and decipher their true meaning, they explain a great deal about the history of Europe, Britain and Christianity. 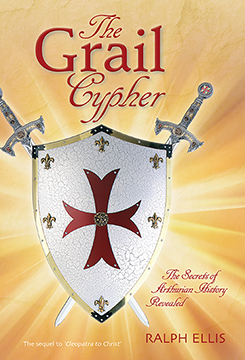 THE GRAIL CYPHER: The Secrets of Arthurian History Revealed By Ralph Ellis. 640 Pages. 6x10 Paperback. Illustrated. References.